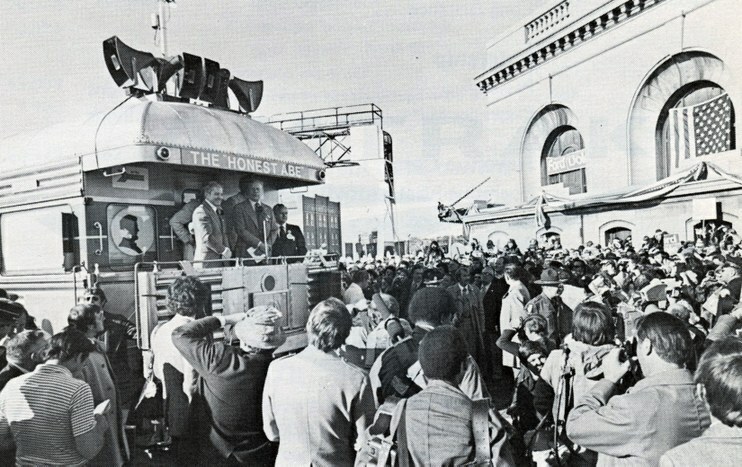 For more than a century, trains and presidential campaigns have gone hand-in-hand, and Amtrak is proud to have carried many of the nation’s modern presidents. According to historians, William Henry Harrison was the first presidential candidate to campaign aboard a train—in 1836. Although he lost that election, four years later he became the first president-elect to travel by train to an inauguration. Coming east from Cincinnati, Harrison boarded the Baltimore and Ohio Railroad in Frederick, Md., to reach the capital via Baltimore. 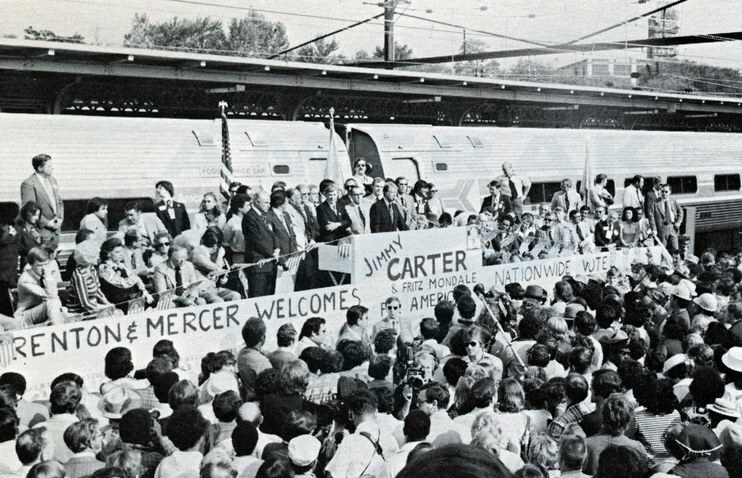 Presidential candidate Jimmy Carter greets supporters at Trenton, N.J.
One of the most famous presidential railroaders was probably Harry S. Truman. During his 1948 “Whistle-Stop” tour, Truman traveled more than 28,000 miles and delivered more than 350 speeches. On that journey, he used the Ferdinand Magellan, a 1928 Pullman car that had been specially outfitted with armor plate and bullet-resistant glass for use by President Franklin D. Roosevelt. Truman’s campaign train typically had 17 cars, including diners, lounges and sleepers. President Eisenhower was the last commander-in-chief to officially use the Ferdinand Magellan, and it was then sold to a railroad museum in Miami. Decades later, President Reagan would use the car during an October 1984 campaign trip through western Ohio. In the town of Sidney, Reagan spoke to the crowd: “How do you like our ‘Heartland Special’ here? You know, Harry Truman rode this state in his whistle-stop tour of 1948, and he spoke some very blunt truths. And that's what I'm going to do.” In 1985, the Ferdinand Magellan was designated a National Historic Landmark and is now on display at the Gold Coast Railroad Museum. A spread in the 1976 Amtrak Annual Report featured photos of President Gerald Ford and challenger Jimmy Carter as they campaigned aboard Amtrak. According to the report, Carter rode from New York to Pittsburgh while Ford traveled in Michigan and Illinois. At Joliet, Ill., Ford gave a speech against the backdrop of majestic Union Station, which celebrated its 100th birthday in October 2012. While running for reelection in September 1992, President George H.W. Bush hit the rails for his “Spirit of America” tour. CSX Transportation (CSXT), with the assistance of Union Pacific Railroad, assembled a special train that ran from Columbus, Ohio, to Grand Blanc, Mich. It consisted of two locomotives and 19 cars. President Bush traveled on the Baltimore, a CSXT office car built in 1924. It had been transported to Huntington, W.Va., on the back of Amtrak’s Cardinal so it could be added to the presidential consist. Photos in the collection of the George Bush Presidential Library and Museum show the president waving to enthusiastic crowds from the car’s rear observation deck. In August 2000, George W. Bush took his campaign to California’s Central Coast, kicking off a whistle-stop tour along the route of the Coast Starlight and the Pacific Surfliner. The trip began with a rally at the intermodal Oxnard Transportation Center. A reporter for the Los Angeles Times wrote, “The train station was decked out with a massive flag and a giant Uncle Sam float that seemed to dance along with the pop tunes piped over the intercom.” Over the next few days, the Amtrak train, consisting of bi-level Superliner equipment, two BNSF business cars and flag-bedecked locomotives, took the candidate through Santa Barbara, Ventura and San Luis Obispo. During the 2008 presidential campaign, the popular ABC "Good Morning America" television program broadcast live from an Amtrak charter train, the centerpiece of a five-day tour through New York, Ohio, West Virginia and Washington, D.C. Amtrak and ABC made history, as it was the first time anything of its kind had been done on live television. Powered by two P-42 locomotives, the 11-car train featured two Superliner Sleeping cars, a Cross Country Café car, two Diner Lounge cars and a Transition Dorm, plus two private cars. ABC transformed one car into a real-time editing suite that kept the show running.